Feature | hologram/thermal transfer film/TTR｜Murata Kimpaku Co., Ltd.
Murata Kimpaku has been supplying the premium quality hot stamping foils to the glass container manufacturers all over the world. 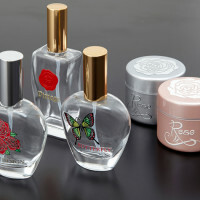 GLEAM brand has a great reputation in glass container manufacturing industry. Strong adhesion, super abrasion resistance and great alcohol & chemical resistance with a wide range of colors. Customized or special colors are available. Murata Kimpaku has the high quality hot stamping foils for plastic tube application. 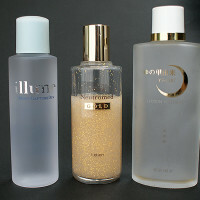 GLEAM brand foil is widely used for the worldwide famous brands. Because of strong adhesion, super abrasion resistance and great alcohol & chemical resistance with a wide range of colors. Customized or special colors are available. Murata Kimpaku is the worldwide leading supplier of pigment foil to the automotive industries. We have developed the pigment foil of speedmeter pointer parts for respective car manufacturers such as Toyota, Honda, Nissan, Mazda, GM, Ford, Hyundai, KIA and more. A wide range of color and fluorescent foils are available. Makie means one of the Japanese traditional art skills and tecniques. Murata Kimpaku introduces the new style of premium look decorative idea. 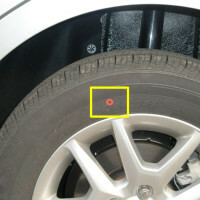 Makie transfer decal is simply sticker made by the mix of traditonal skills and advanced technology. Advantages are muti-colors with different materials such as metallic foil, metallic powder, pantone color ink, 3D embossed effect, strong adhesion (water and heat resistance) to the hard surface substrates, easy transfer by manual (no need of water, heat or equipment), and it can be applied on curved surface. Original or customized design decal is available. Murata Kimpaku has been supplying thermal transfer ribbon to over 3,000 customers in Japan and overseas for more than 35 years with experienced sales professionals. 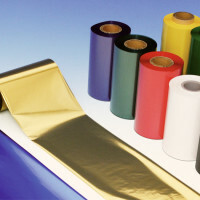 Our thermal transfer ribbon such as Wax, Wax/Resin and Resin type is widely used in many industries and has reputation of high quality and competitive pricing. Copyright © Murata Kimpaku Co., Ltd. All Rights Reserved.